At every party, you’ll always find a group of people socializing by the food table, mindlessly munching on snack mix. 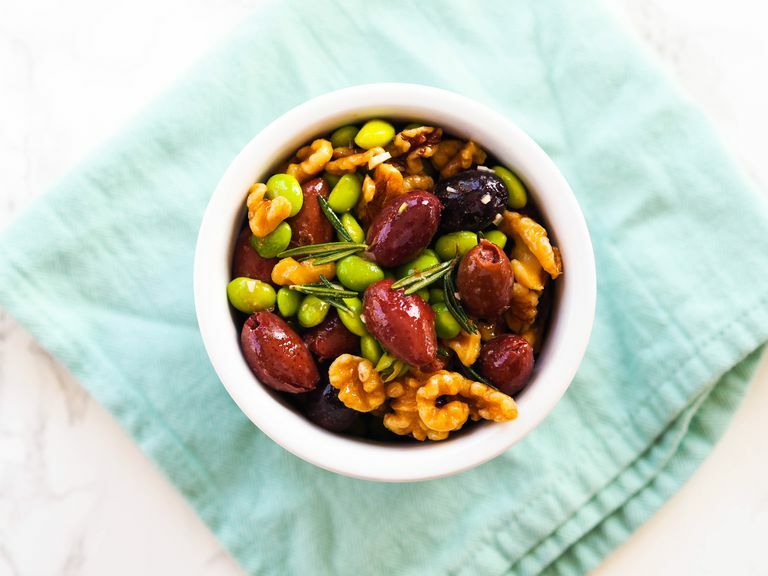 Treat your guests with this healthy and tasty recipe for garlicky olive, walnut, and edamame mix. It’s low-carb and packed with protein. Plus the leftovers, if there are any, make an easy to packable portable snack! Serve immediately. Refrigerate any leftovers. This recipe is a fun way to experiment with different kinds of olives, which all have their own unique flavor. Pass over canned and splurge on high-quality olives, since the olives are the predominant flavor in this recipe. You can use a mix of different olives to keep it interesting. Try Castelvetrano olives, which have a mild, smooth and buttery taste, briny and bitter Nyon olives, or rich and oily Nicoise olives. A tip for those who struggle with eating mindfully: use olives that still have the pit. This forces you to slow down and enjoy the flavors, lest you accidentally swallow a pit! Keep in mind, if you’re serving this at a party, you may want to put out a small bowl for guests to dispose of their pits. Just as you can use different types of olives in this recipe, you can also use different types of nuts. I also enjoy this with toasted hazelnuts, pistachios, or almonds, all of which work deliciously with the Mediterranean flair of this recipe. If you​ or any of your guests are allergic to tree nuts, try this with pumpkin seeds, sunflower seeds, or even crunchy roasted chickpeas, which you can make yourself or purchase at most well-stocked grocery stores. Make this dish even more delicious by adding a sprinkle of crunchy or flaky sea salt, which adds texture and brings out even more flavor. Be sure to toast your walnuts before making this dish. It intensifies their flavor and adds extra crunch. To quickly toast nuts, I usually put mine in a small baking dish in the toaster until their nutty perfume starts to fill the kitchen, usually about 7 minutes. If you’re making a larger batch, you may want to toast your nuts in the oven. Spread them flat on a baking sheet and toast at 400 degrees for about 10 minutes. You could also toast them in a dry skillet over medium heat, tossing frequently to prevent burning. Whatever method you use, be sure to check your nuts frequently as nothing will ruin this recipe more than the bitter flavor of an overly toasted nut. This recipe only uses a tablespoon of rosemary, so you’re sure to have some leftover. Add it to a marinade for chicken or pork, along with lemon juice, garlic, honey, and mustard. Or sprinkle it over roasted cauliflower and potatoes. It’s a nice sturdy herb, so leftover rosemary also stores well in the freezer.